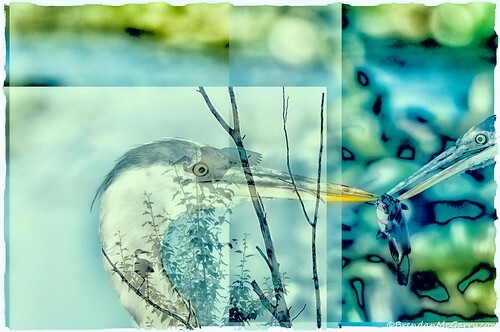 Great Blue Herons (Ardea herodias) are ubiquitous and easily observed. So common, widespread, and obvious that they are easily written off. You’ve seen a lot of them and will see many more, as they are one of the most adaptable waterbirds in North America. These are gems we should really cherish. Species we can become truly familiar with, because in the case of birds, familiarity doesn’t breed contempt. We should not just note their presence, but really make an effort to know them. 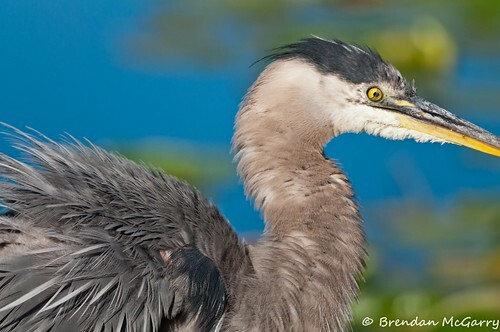 In Seattle, we share our city with herons anywhere there’s shoreline and we’ve even made them our city bird. Some people become heavily involved in their natural history, anointing themselves caretakers of heronry sites, keeping watch. Others merely notice them standing at the Ballard Locks or flying over their house in the middle of the city. Most people in Seattle know them because of their size alone, which makes them easy to observe. I’d hazard they are as iconic of birdlife to the general public as Bald Eagles. Yet, while I always note a GBH, as many birders call them, I wouldn’t suggest I spend tons of time thinking about their habits or that I have an intimate understanding of them as a species. 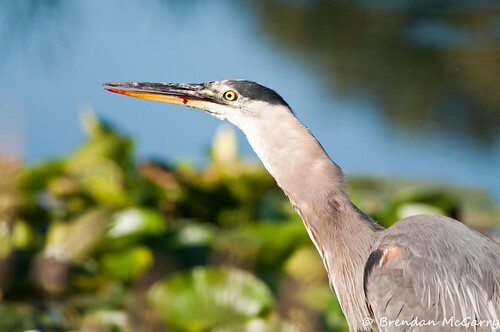 I generally know what most birders know: that they nest in colonies, they eat fish but have quite varied diets, that they are the largest herons in North America, and are very common. I always try to push myself to learn more, not by reading or studying photographs, but by observation. When the opportunity presents itself, I try to not keep walking and do what is all too easy to say. I resisted the urge recently and was graced with some decent photos and some enjoyable behavior. 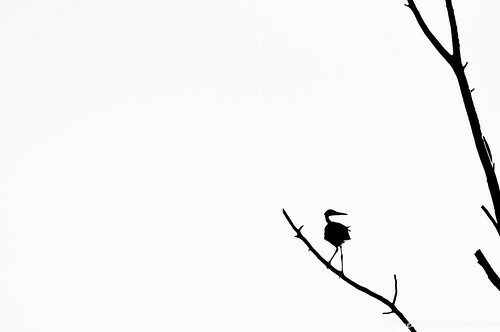 This particular bird was obviously hunting – standing intensely still over a clear patch of water on the edge of Union Bay on Lake Washington. I decided to settle down, take a few shots, wait, and observe. Of course as I decided this, the bird made its move, diving almost completely into the water. Wet and gangly, the bird flopped back out of the water with a small catfish adorning the end of its spear-like bill. Blood began to trail down the protruding bill tip and it began a series of head waggles to loosen the quarry. 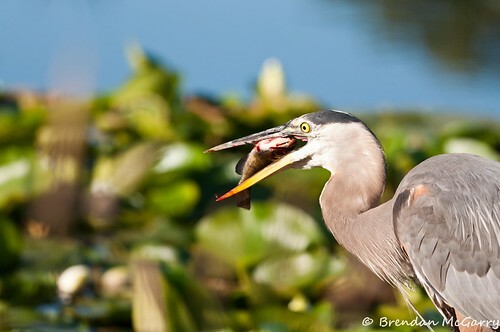 Eventually the fish slid off and at the same time the bird deftly tossed it up and caught it head first. 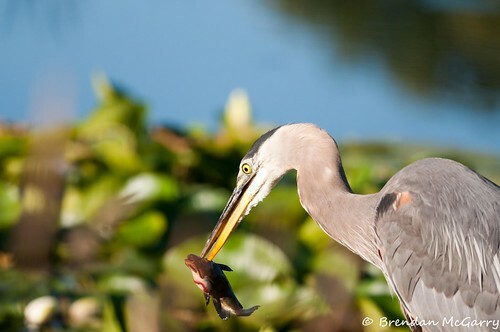 Swallowing the catfish in this orientation, a creeping lump that slowly slid down the heron’s gracile neck, reminiscent of a snake’s dinnertime. As I watched this mealtime, one of thousands this bird would have all summer, I realized I’d never seen a heron swallow something so large. I’ve been watching birds for 18 years, much more of my life then I haven’t, and I’ve never seen this simple act in person. There’s always something new to see, even when you think you’ve fully explore your backyard, you’ll discover some nook, casting everything in a new light. With Summer flying by, I always need to find small pleasures. Mulling this over, I watched the bird go through the post meal motions. Bill rubbing, splashing the blood off in the water, and a series of yawns that left its tongue dangling at odd angles. All of a sudden, it turned to look at me, as if suddenly realizing what I was, and took off with a raucous squawk. Thanks so much for the reminder to notice what is so often overlooked for being so “common”. great entry & photos. rep ’em. Lovely post, and how right you are about looking out for new discoveries in the backyard, nature’s full of surprises.